The radically new solution for seismic acquisition and imaging. Vetle Vinje is Principal Research Geophysicist at CGG Subsurface Imaging and the project he is talking about is an innovative new concept in seismic acquisition and imaging, the result of several years of collaboration between the geoscience company, CGG, and oil company, Lundin Norway AS. In the revolutionary TopSeis acquisition method the seismic sources are deployed over the streamer spread to make use of the full range of reflections. 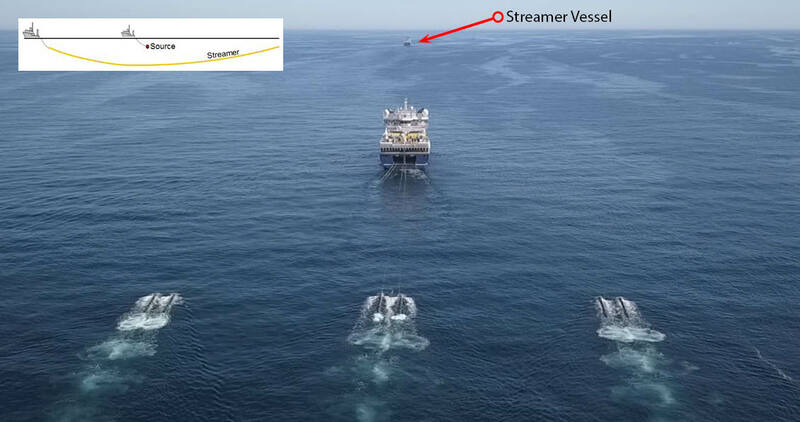 In this first full-scale acquisition in the Barents Sea, photographed using drone technology, the sources are positioned directly over the streamer spread, which is being towed by the streamer vessel several kilometres in front. The deep ‘banana-shaped’ configuration of the streamer ensures notch diversity, enabling robust processing-based deghosting. Image courtesy of CGG. Schematic comparison of conventional and TopSeis configuration. Images courtesy of CGG. Lundin Norway approached a number of seismic companies in an attempt to find a solution to this imaging challenge, and in 2015 began working on a detailed solution with CGG, with whom it had previously collaborated on several technology projects. The challenge was to improve imaging of shallow and intermediate-depth targets by overcoming the fact that conventional towed-streamer seismic lacks the near-offset data (the reflections recorded when the source and hydrophones are close together) which are crucial for illuminating such areas. Together, the companies came up with a revolutionary – and initially very controversial – new idea. “As we all know, in conventional seismic acquisition a single vessel tows both the source and the streamer,” Vetle explains. “This means that much of the source energy is directed forward and is not recorded. In addition, with shallow targets only the nearest offsets contribute to subsurface imaging as reflections soon approach the critical angle and are lost. Conventional and TopSeis marine acquisition layouts with corresponding offset/azimuth rose plots with offsets up to 1000m. 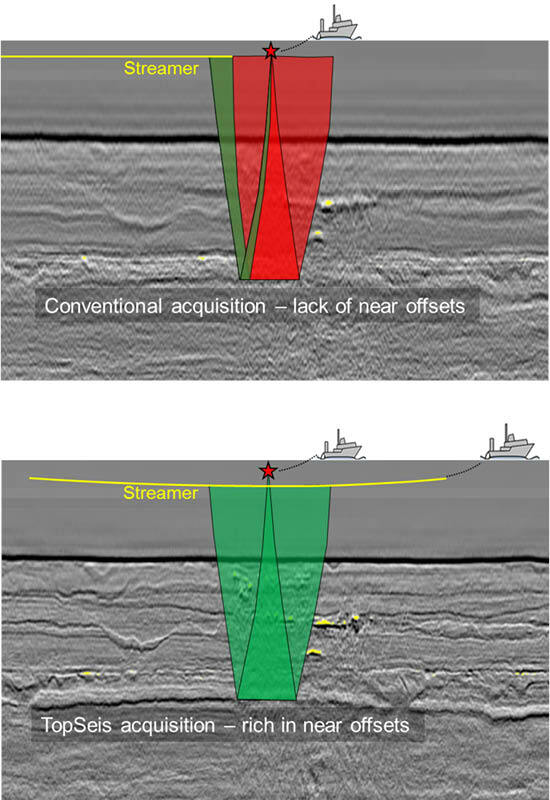 The highlighted circles show near-offset data surrounding the airgun source arrays Image courtesy of CGG. “First of all we undertook a lot of synthetic modelling to derive the optimum configurations for specific targets and to develop methods to deploy these configurations safely; this is why I got involved, as modelling and seismic processing are my areas of expertise,” Vetle continues. “We spent two years working on the modelling, finding the best positions for the source vessel, how far apart the sources should be and the ideal horizontal streamer separation distance for specific targets. 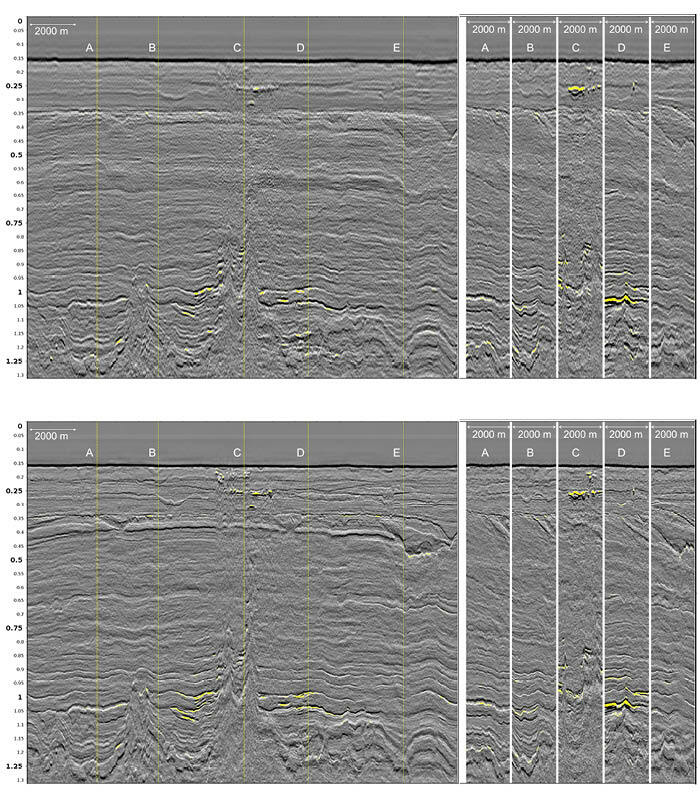 Synthetic seismic data from a series of acquisition designs with real noise added were fed into our 3D seismic processing and imaging workflows to determine theoptimal processing criteria. Having confirmed that in theory the new acquisition system would achieve the main objectives, by late 2015 the companies were ready to undertake field tests to ensure that all the practical aspects of the acquisition would work. These included, crucially, safety, to confirm that towing the source above the streamers posed no risk, and also navigation and vessel manoeuvring and equipment durability, as well as actual data processing and imaging. In March 2016 a single test line was shot off Gabon in West Africa, followed by a 3D test over the Frigg-Gamma structure in the North Sea in June the same year. The Frigg area was chosen for the 3D trial because it is known to present imaging challenges due to the presence of leaked hydrocarbons in the shallowest 2,000m – plus a conventional 3D survey over the area was scheduled a month later as part of CGG’s multi-client programme, so it would be possible to make comparisons between the two. 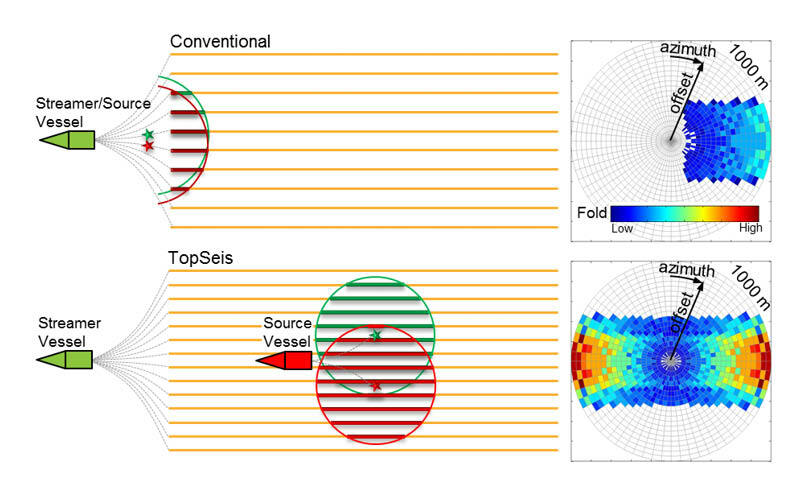 The two datasets went through the same processing workflow, including basic denoising, source designature, receiver deghosting, demultiple, regularisation/binning and prestack time migration in a simple isotropic velocity model, with additional processing to eliminate direct wave and similar issues in the TopSeis data. Lundin actively participated in the TopSeis development every step of the way. 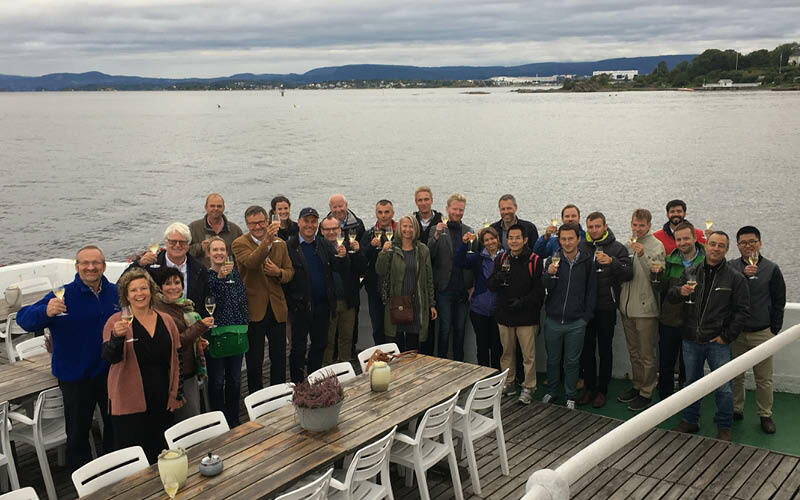 Their management team and key project contributors visited the Geo Coral during the TopSeis survey in the Barents Sea this summer. 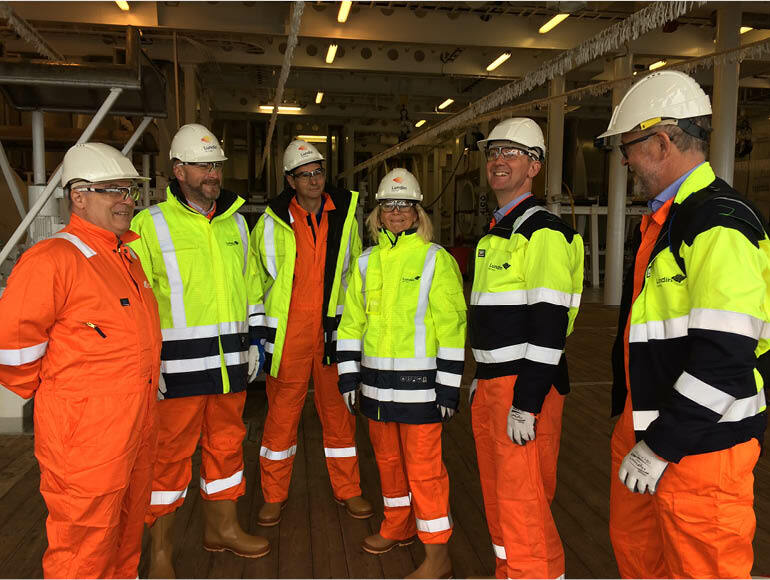 (Left to right): CEO of CGG Jean-Georges Malcor with the Lundin Norway delegation: Halvor Jahre (Exploration Manager), Jan Erik Lie (Chief Geophysicist), Kristin Færøvik (Managing Director), Per Eivind Dhelie (Senior Geophysicist) and Vidar Danielsen (Senior Geophysicist). Photo credit: Lundin. Finally, having proved beyond doubt that this revolutionary new acquisition concept could enhance the imaging of shallow and intermediate reservoirs, Lundin Norway was ready to take it live with the first full-scale commercial TopSeis survey. With Lundin Norway’s partners on the Barents Sea acreage, a 1,950 km2 survey over the Alta Gohta discoveries on the Loppa High was undertaken between July and September this year. The final results are due in summer 2018 but already it is clear that the imaging issues, particularly with regard to the shallow carbonate reservoir in the Loppa High, have been successfully addressed. 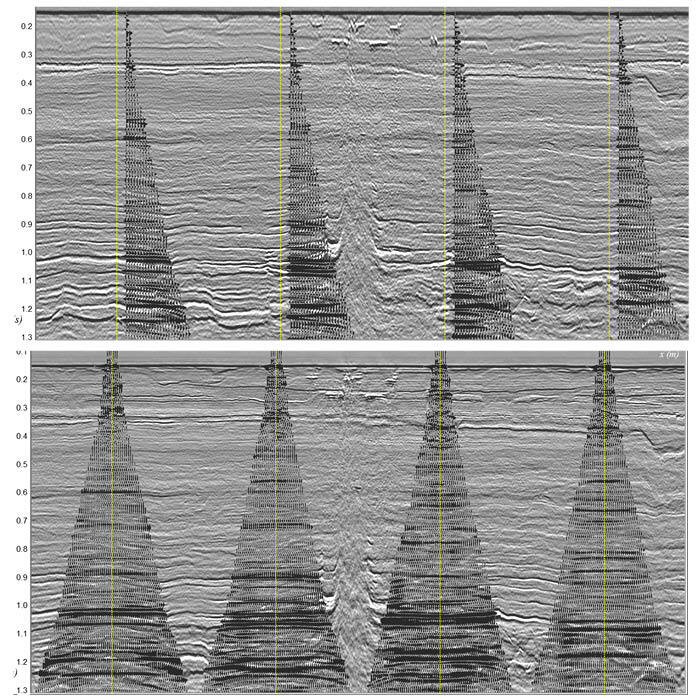 Dense and uniform crossline shot sampling is important for 3D seismic resolution within the shallow section. A comparison between the conventional (top) and TopSeis (bottom) records for an inline and five crosslines show significant improvement with the new method. Image courtesy of CGG. “We were all very pleased with the early results,” Vetle says. “Not only did the records demonstrate a step-change in the imaging of shallow to intermediate depth targets in comparison to conventional surveys in the area, but the water-bottom image was also very good, clearly showing the hard, iceberg-scoured nature of the seabed. These images were comparable to those normally obtained from traditional multi-beam sonar. “What’s more, less infill than usual was required and, because of the deep towed streamers, the system is more robust and tolerates higher sea states. The project came in on time and on budget, with hardly any technical downtime and no HSE incidents: an undoubted success. “This means that, despite requiring two vessels, TopSeis is a very cost-effective seismic acquisition method, particularly when compared to an ocean-bottom survey, which is the only other way to acquire marine zero-offset data,” Vetle points out. “The technology is also ideal for areas other than the Barents Sea. Since the improved imaging and reservoir analysis is evident from about 3,000m depth right up to the seabed, it would be useful, for example, over much of the North Sea, since many of the fields are at about that level. It is also an ideal tool for identifying shallow gas pockets and other hazards. Vetle is very keen to point out that this major development in seismic acquisition and imaging is the result of a significant and effective collaborative effort by the 100-strong multidisciplinary team from Lundin Norway and CGG. In the case of the latter this included CGG and Sercel experts in equipment, marine acquisition and geoscience based in Norway, France, the UK and the US. As he says: “This is the way ahead; oil companies with a challenge need service companies with skills and creativity so they can work together to find solutions. This requires a lot of trust between the parties, and it probably helped in this case that the Lundin Norway and CGG offices that were leading the research in Oslo were physically very close, so if we had a question or an idea, we could just pop round and see our colleagues in the other company. Having collaborated with Lundin Norway on a number of projects previously, we knew we could have a successful partnership.